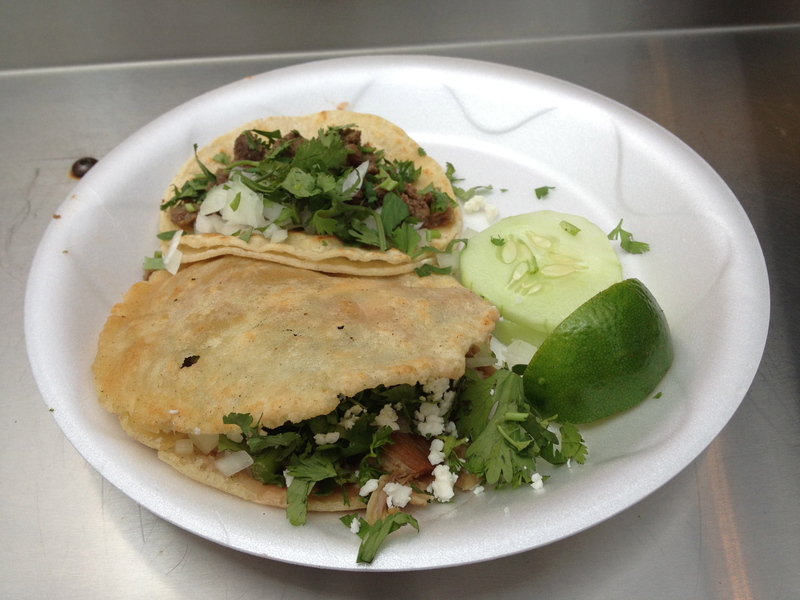 We seen a few seafood-focused taco trucks come and go on the west side before but Aguachiles brings this novelty the east side. 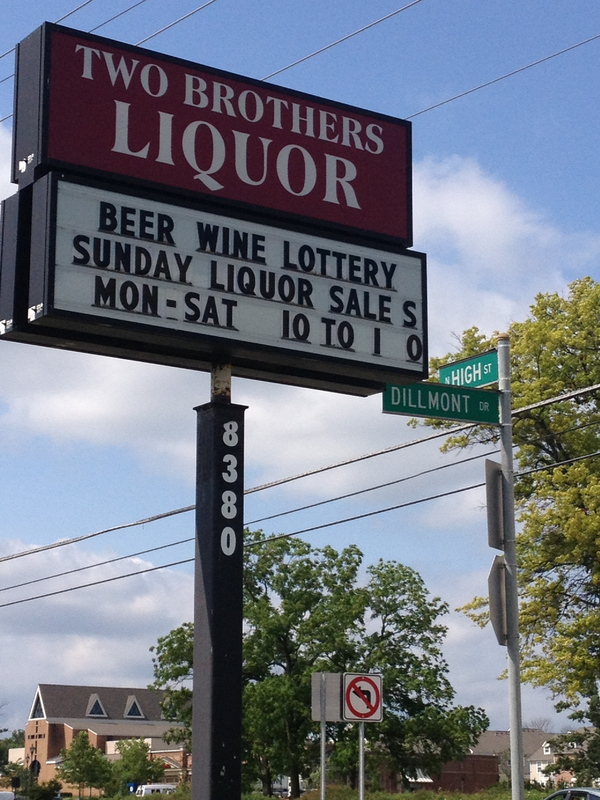 Found on north Cleveland Avenue just south of 270, it’s conveniently (if you’re getting take out) located in the parking lot of a beer store. 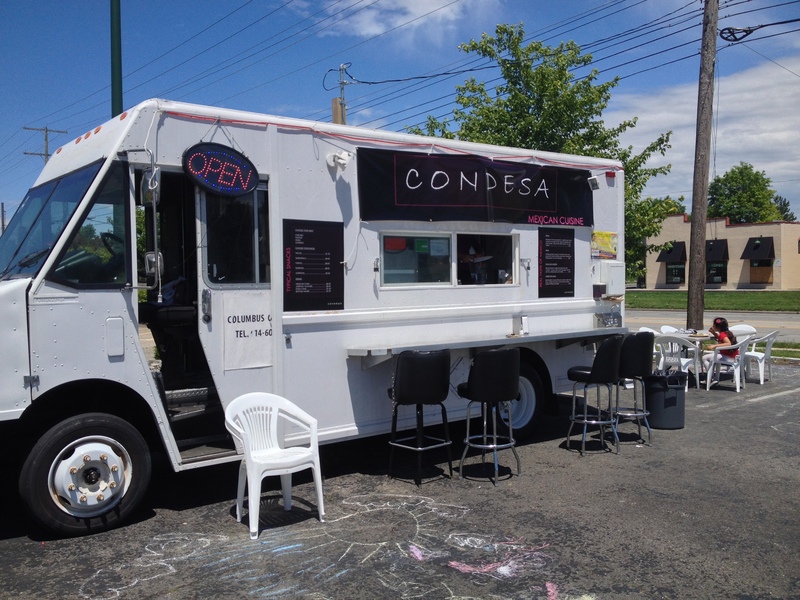 The truck takes its name from the dish – aguachiles – which is a shrimp ceviche in which the shrimp are essentially cooked in lime juice. 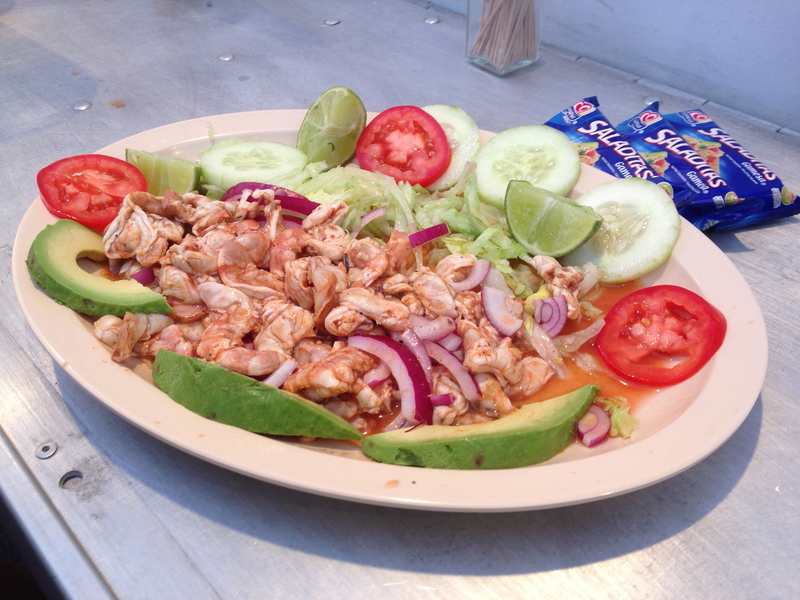 Usually aguachiles are very spicy but the version at Los Aguachiles was probably the mildest version we’ve had. It didn’t suffer for the lack of heat and I’d imagine you could order it spicier. 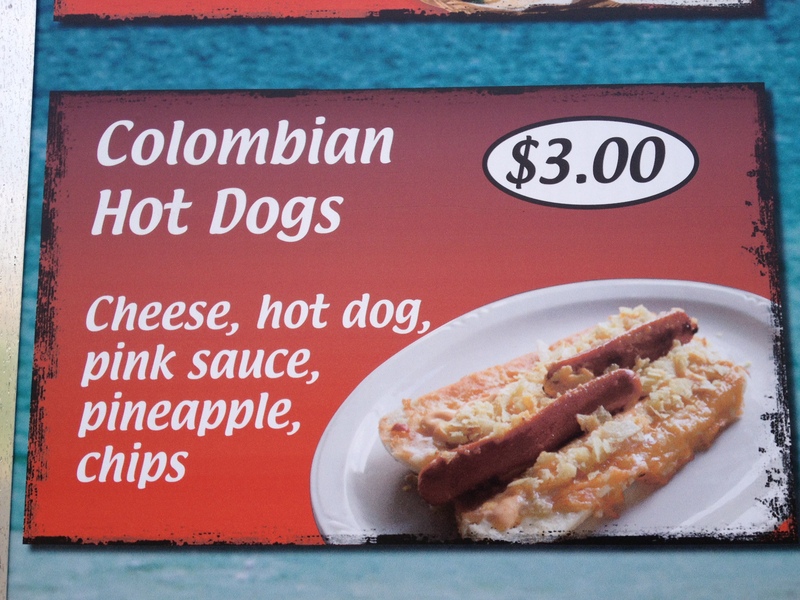 As is traditional, it’s served with crackers and tostadas. 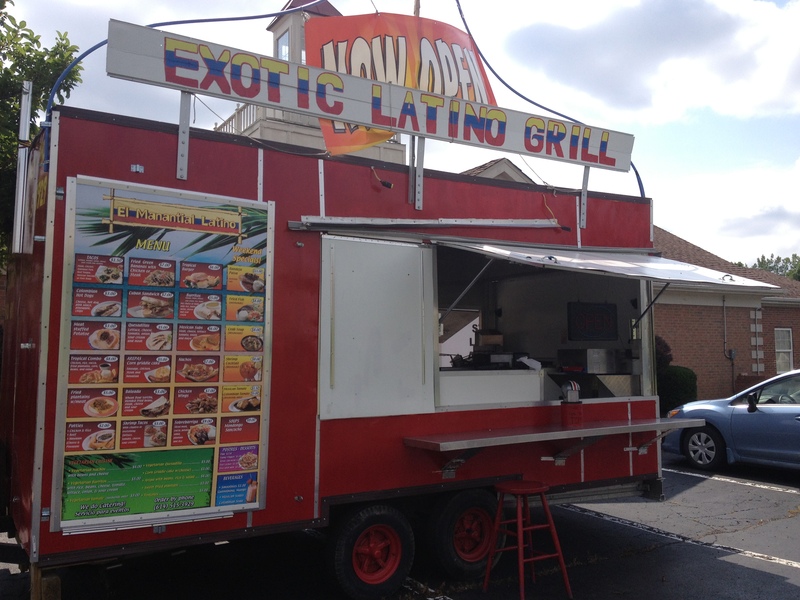 The truck offers several different versions of shrimp cooked on the grill. The main difference seemed to be different levels of spice. We enjoyed our order of camarones a la plancha. The shrimp were grilled with onions and peppers and still had a little kick even though this was reputed to be the mildest option. 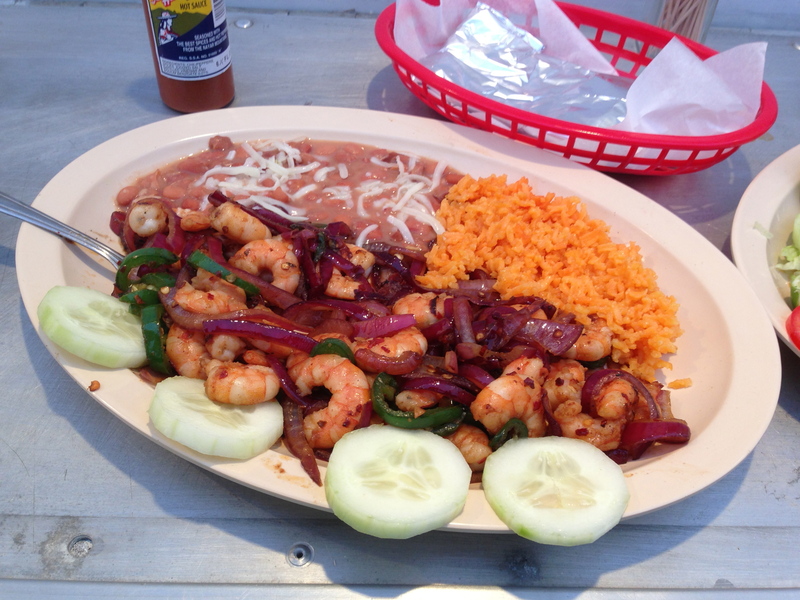 They were served with cucumber, rice and beans as well as tortillas. 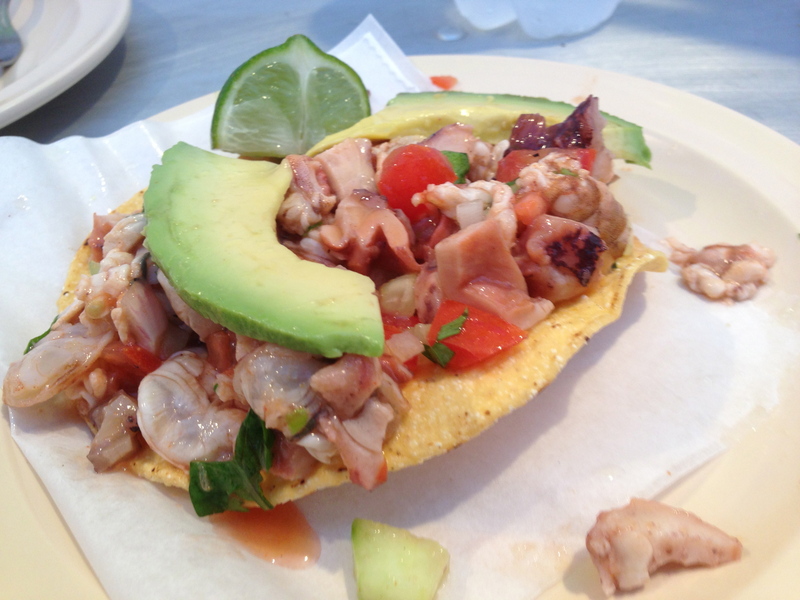 We also tried a tostada de camarones y pulpo (shrimp and octopus) which proved to be a solid version of the dish. Not too spicy but with plenty of lime and some avocado. 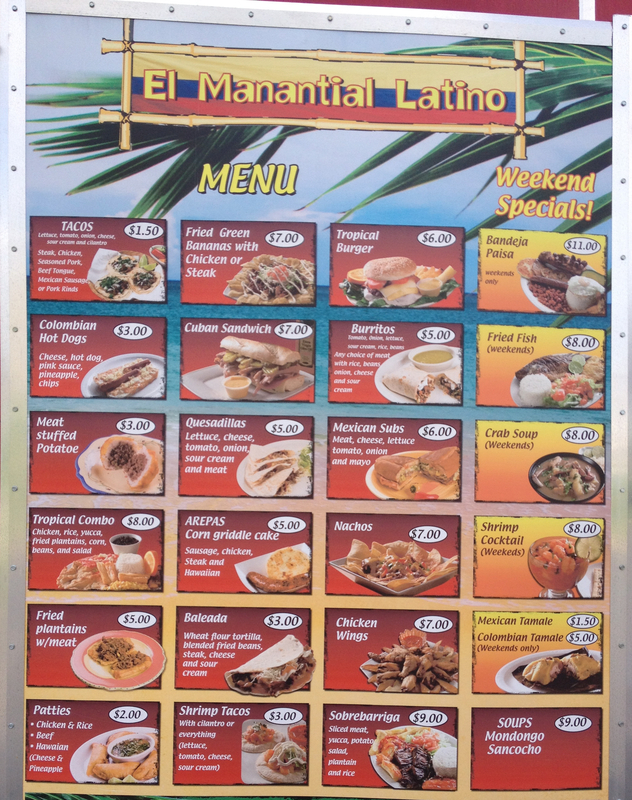 In addition to the seafood, there are plenty of meat options including the usual taco truck staples of burritos, tacos, tortas and quesadillas. 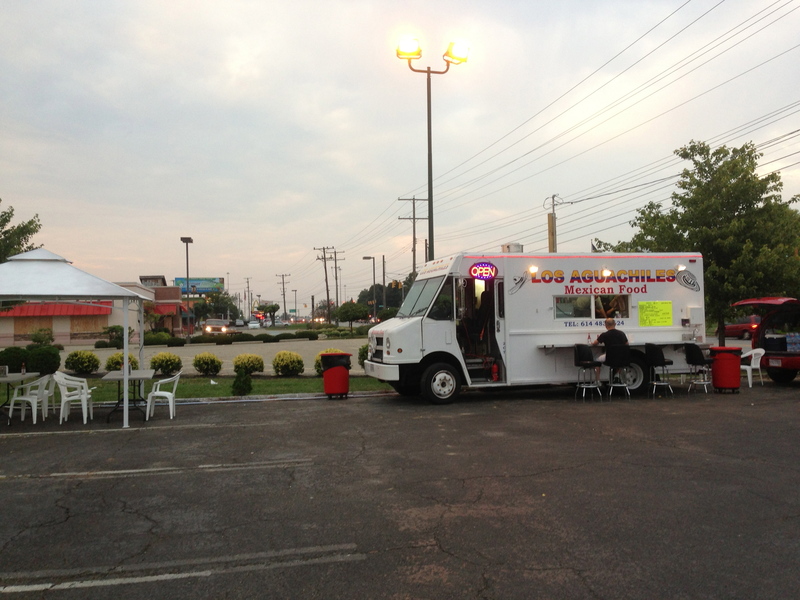 The truck has a tent with some seating and the owner and staff were friendly. 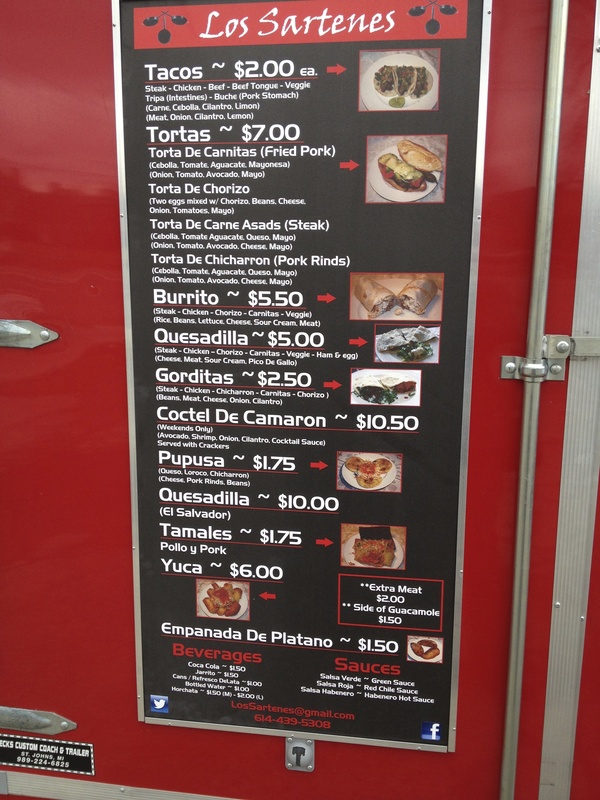 The truck had only been open 3 days when we visited so we expect the menu and hours to evolve as they get established. 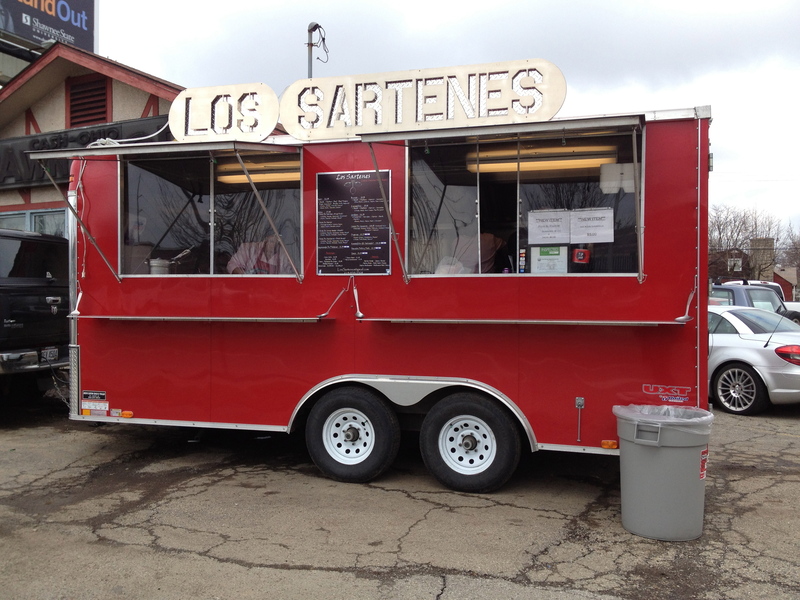 El Taco Peton is the sibling truck of El Taco Peton on Karl Road. Same owners, different but close location. It is currently only open on weekends. Chalupas – a taco with mashed potato and onion and topped with lettuce and shredded chicken. 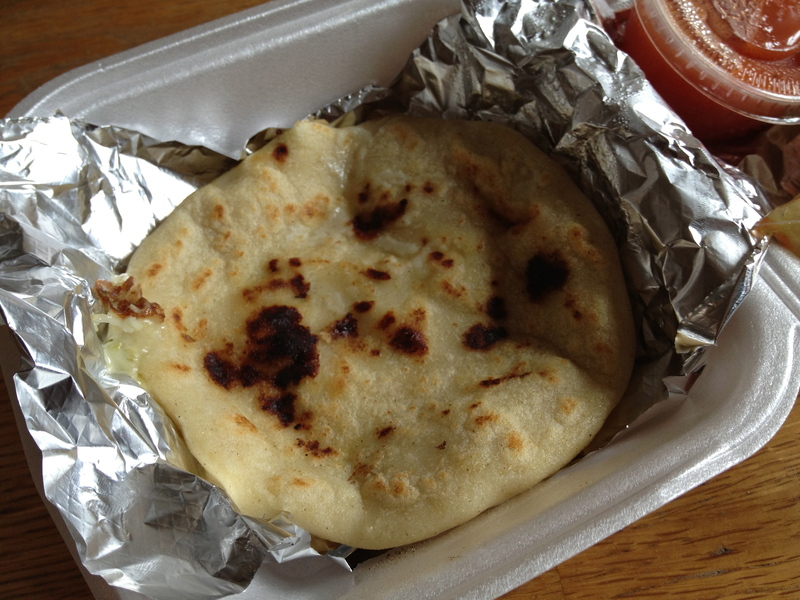 Pupusa – popular Central American stuffed corn cake usually filled with cheese, beans, meat or a mixture of the three. Nopal is the pads of the prickly pear cactus and it is usually served grilled in strips. Generously plump and not greasy pupusas served with a generous helping of curtido (slightly fermented slaw). The curtido was notably herby in flavor. 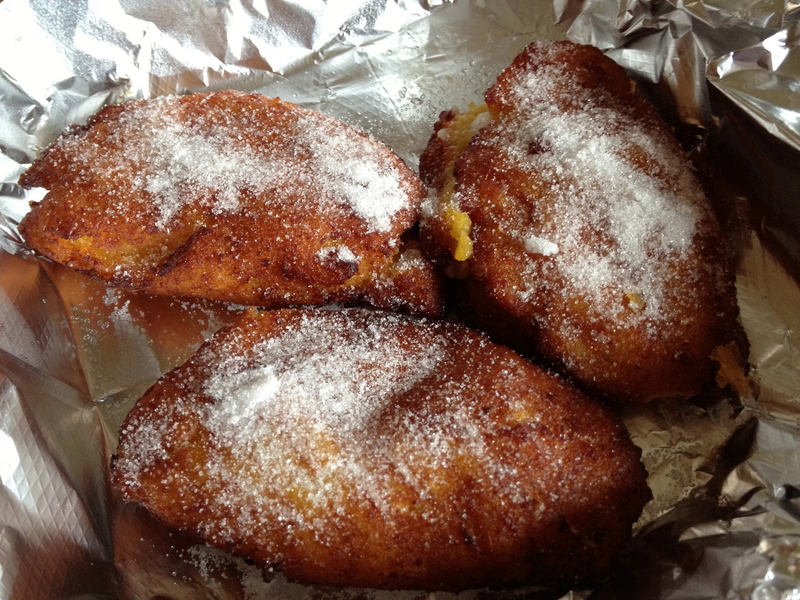 Pambazo sandwiches are usually dipped in red sauce and then cooked on the grill. That’s not the case here. The sandwich is good, it’s less messy to eat, but it’s not our favorite in this part of town. That honor goes to Don Pedro’s. 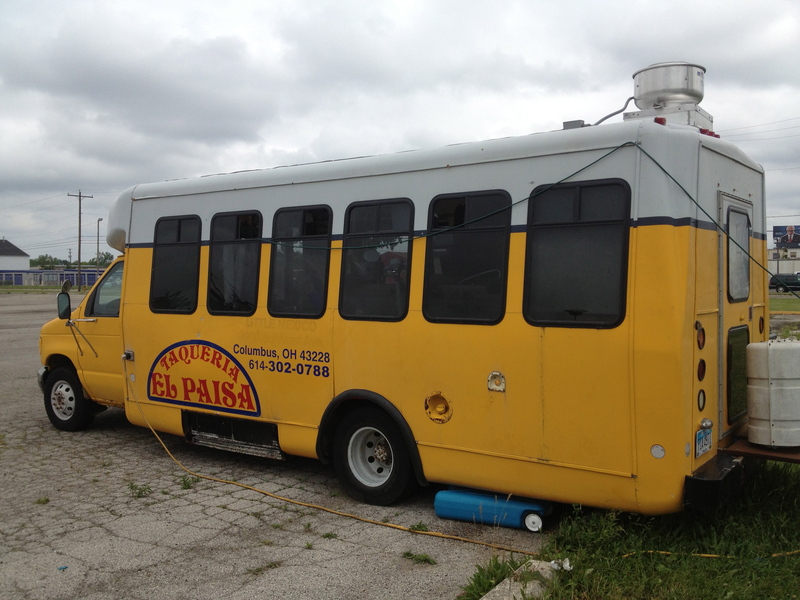 El Peton (I & II) are the only trucks we’ve found offering chalupas. It’s a shredded chicken taco with lettuce, finely chopped radish, cheese and mashed potato! 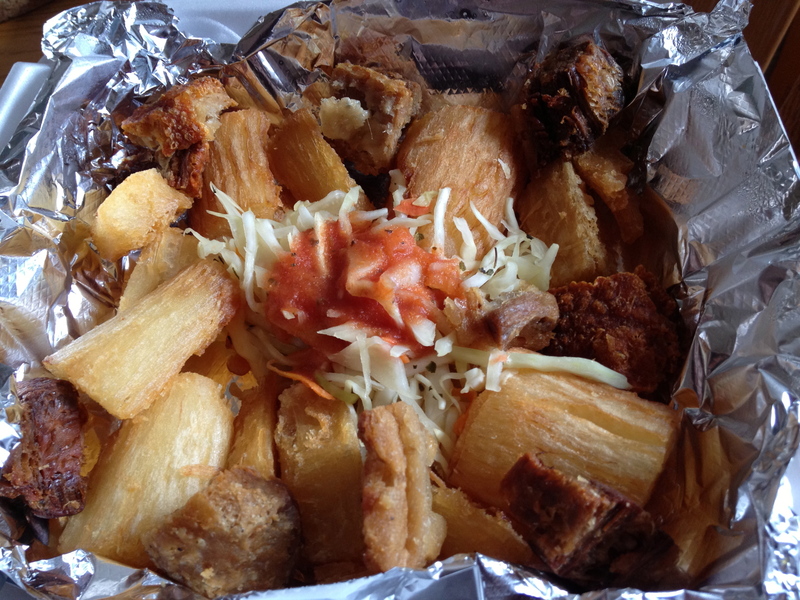 It’s a good option for those who don’t like spicy food – or you can add some hot sauce to jazz it up. 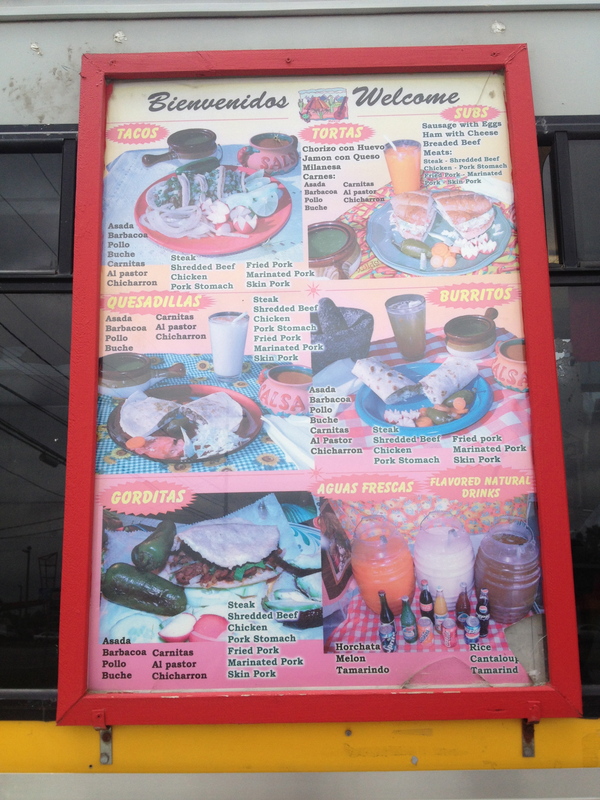 El Peton also offers some Sunday specials: goat barbacoa and goat consume. Consume is a meaty soup made with the cooking liquid from the barbacoa and served with finely chopped onions and cilantro. It’s a great accompaniment to the barbacoa tacos.